Dr. Prasad Srinivasan (Dr. S) is a longtime resident of the Town of Glastonbury. He is an allergist practicing in Glastonbury and the Hartford area for over 30 years, and treats pediatric and adult patients with allergies. On November 8, 2016, Rep. Srinivasan was elected to his fourth term as the State Representative of the 31st Assembly District. He is a member of the General Assembly’s Public Health (Ranking Member), Environment and Judiciary Committees. 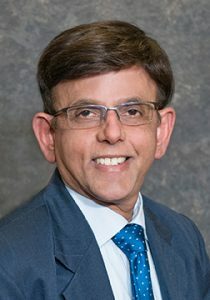 Rep. Srinivasan is a graduate of Baroda Medical College in India, and then did his fellowship in allergy and immunology at Michael Reese Hospital in Chicago. He was chief pediatric resident at Brookdale Hospital in Brooklyn, NY. He is certified by the American Board of Pediatrics and the American Board of Allergy and Immunology. Prasad Srinivasan has diverse interests and accomplishments. His community involvement is remarkable and has been recognized on numerous occasions. Prasad Srinivasan is married to Mrs. Kala Prasad, a professional musician for 33 years. Their two children graduated from Glastonbury High School. His son, Dr. Sashank Prasad, is on the faculty at Harvard Medical School, and his daughter-in-law Mrs. Kerry Prasad, high school teacher by profession, is currently a stay-at-home mother, taking care of their two children. Rep. Srinivasan’s daughter, Ms. Anusha Prasad-Rodriguez, a graduate of MIT and Wharton, is currently Head of Alternative Investments with Oppenheimer. She and her husband, Paul Rodriguez, Director at VWM Analytics, have two daughters.